NASA’s Cassini spacecraft has taken close-up images of propeller-shaped features in Saturn’s rings caused by tiny moons shooting through them. During its flybys of the planet, Cassini recently captured an image of the biggest one of these propellers, linked to an especially large “moonlet” called Bleriot, named after the first aviator to fly over the English Channel more than 100 years ago. Scientists are using the observations to understand better how the tiny moons streaking through Saturn’s rings interact with those rings, and vice versa. You can’t see the moonlet in this photo because it is “obscured by the stirred-up ring material around it,” NASA said, but it is in the middle of the propeller and is almost a mile across. 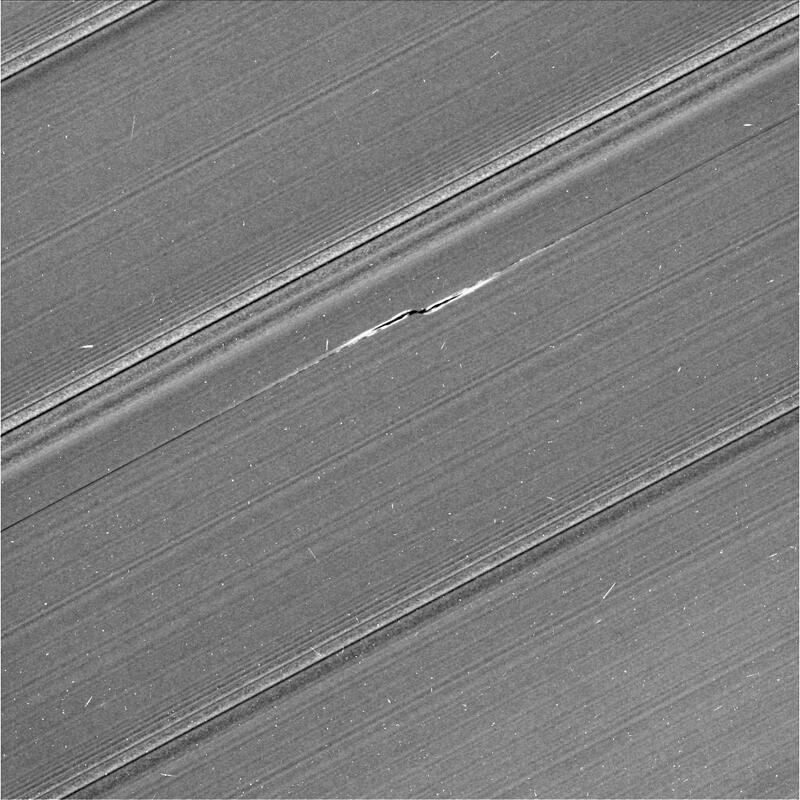 In that dark band, the density of the particles it has kicked up “is so high that the ring becomes opaque to the sunlight filtering through the rings.” On the propeller’s outline, the tiny moon’s gravity is creating small bright waves that are visible in the propeller as it displaces material in its way, kind of like splashing water out of a pool. The other specks and scratches are from cosmic rays and radiation particles interacting with the camera. There are many propellers in Saturn’s rings although many are significantly smaller than Bleriot. 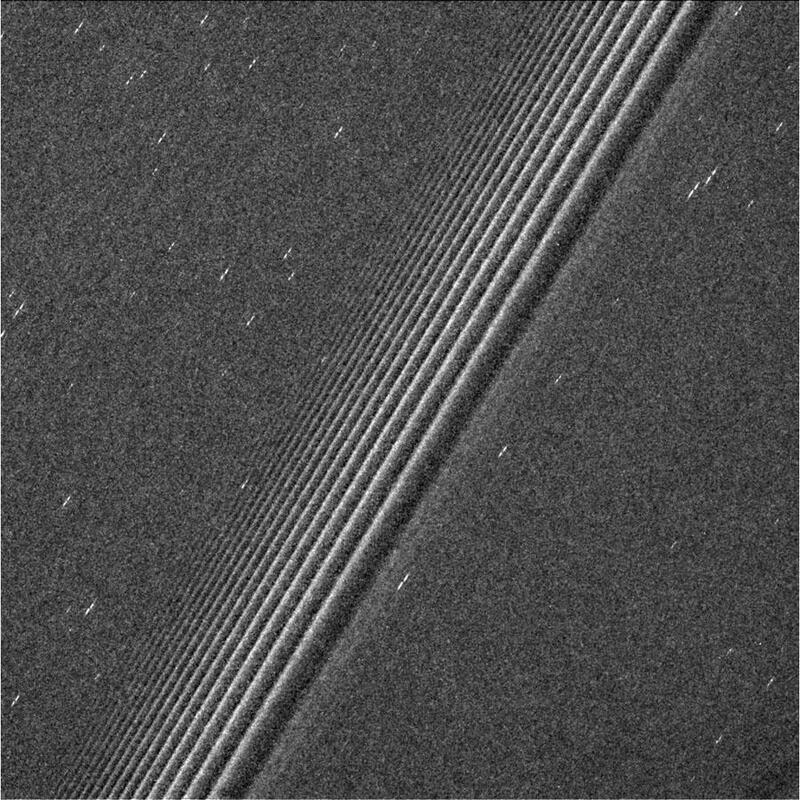 Another image Cassini recently snapped during its close flybys was of a “swarm” of variously sized propellers in the middle of the planet’s A ring. NASA said experts will take what they can from this view to learn more about the moonlets and how they formed. Moonlets were not officially classified until relatively recently. Although they are much smaller than full moons, they are larger than the dust and other particles in the rings surrounding them. Although one of the tiny moons was obscured in the image of Bleriot, these bodies are not entirely unseen. Earlier this year, NASA released a detailed close-up image of a 5-mile “wavemaker moon” called Daphnis barreling its way through one of Saturn’s rings and stirring up material along the way. The Cassini spacecraft has been observing Saturn and its moons for several years and is on the final leg of its journey, what NASA is calling the grand finale, before it runs out of fuel and is sent into Saturn’s atmosphere to burn up. It has been sending back images and data from the outer solar system to which scientists never before had access, including from the gap between Saturn and its rings. One of its more popular discoveries recently was a source of hydrogen on the moon Enceladus that potentially could be used as a fuel source for alien life.